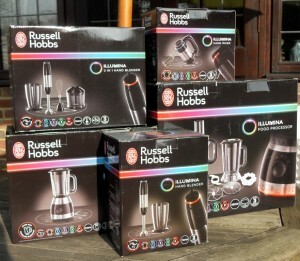 I was very excited to be invited to take part in a Virtual Blogger Come Dine With Me organised by Russell Hobbs in which I could use any of their Illumina range of products to make my course. I was allocated the starter and after unpacking all 5 of my new products which included the Illumina Jug Blender, 3-in-1 Hand Blender, Hand Mixer and Hand Blender I made a bee line for the Illumina Food Processor, because believe it or not, I have never owned one and have wanted one for a long time! 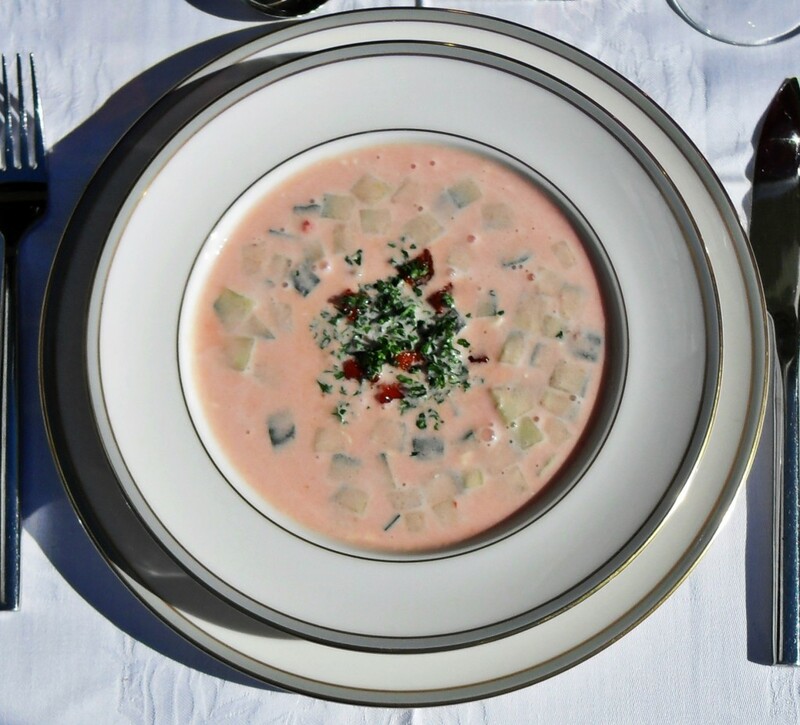 With the weather gradually turning warmer I decided that a chilled soup would be a refreshing starter for the meal. Michelle over at Utterly Scrummy is making the main course which she will post on Wednesday (26/3/14); my mouth is watering already as I know what she’s making! Dessert is going to be lush on Friday (28/3/14) as Sarah over at Maison Cupcake will bringing this to the virtual dining table! I’ve never had my fine bone china out on the blog before but this is a dinner party! The Russell Hobbs Illumina range is very smart with its high gloss black finish and brushed steel panels plus all the blades are titanium coated meaning they are 4 times harder and stay sharper for longer. The products also have an innovative colour control light ring that that changes colour according to which speed it’s at – there’s a guide as to which colour suits which foods. Being new to using a food processor it took me a little while to get the hang of the basics like not being able to remove the jug from the base until you had removed the lid. There were cries of “I can’t get the jug off the base, come and help me” to my husband who then came to my rescue, tutting loudly at my stupidity! It really is a good job this wasn’t being filmed and reaffirms the reason why I’d never go on the actual Come Dine with Me! 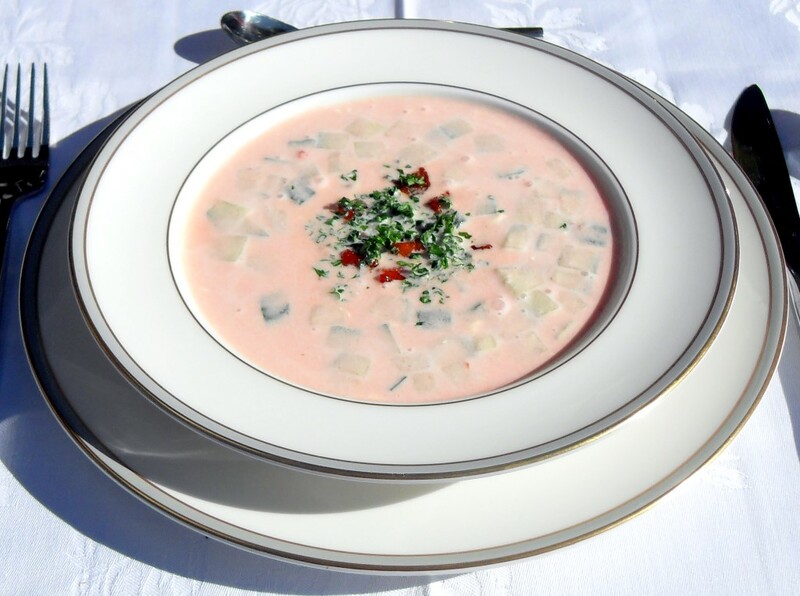 This soup may look all girly and pink but believe me her flavour packs a punch! So back to the soup – I wanted to create something refreshing yet tasty combining the flavours of Spain so used vine ripened tomatoes with garlic, lemon and red chilli for zing and then cucumber and cream for balance – I think I nailed it. I’ve never really been a chilled soup sort of girl and I’m not a fan of tomato juice but this soup was superb! It tasted fab before I’d even added the cream and cucumber but once those were added along with the chorizo and parsley garnish, to quote my mum “the angels were singing”! I nervously served up a bowl to my husband just to get him out of the kitchen whilst I did my photography. Would he affirm what I thought – it’s always a tense moment because we don’t always see eye to eye where food is concerned. But I needn’t have worried as he absolutely loved it and my chilli loving son also enjoyed a bowl. Needless to say my young daughter wouldn’t go near it as she’s not a lover of spicy food. 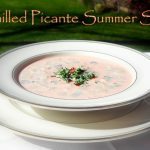 So as a starter for an adult dinner party I can’t recommend this Chilled Picante Summer Soup enough – I hope my virtual diners Michelle and Sarah enjoy it too! 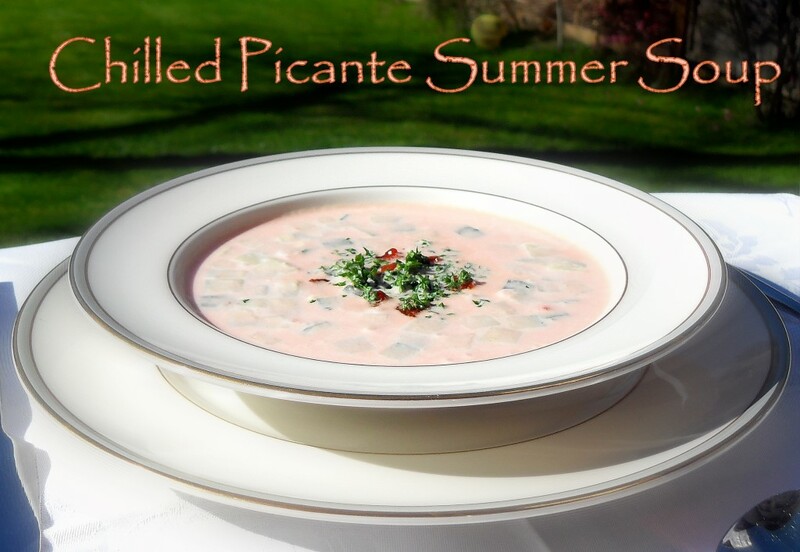 A chilled spicy summer soup with all the flavours of Spain - vine ripened tomatoes mingle with red chilli, garlic, lemon, cream and cucumber which is then garnished with chorizo and parsley. Chop the tomatoes into quarters and blitz in a food processor. Sieve the puree (a bit of patience required here). This should yield just under 600 mls of tomato juice. Fry the chorizo pieces in a drop of oil (they create their own) for a couple of minutes until crispy, drain, allow to cool and then chill. 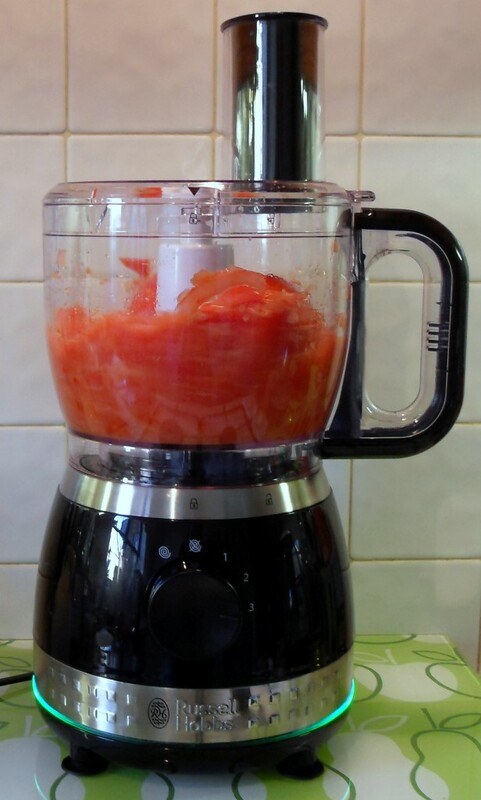 Once the tomato juice is thoroughly chilled put back in food processor and add the garlic, red chilli, sugar, salt, lemon zest and juice and blitz until smooth. Transfer the soup to a bowl and stir in the double cream and diced cucumber. Serve the soup in bowls garnished with the chopped parsley and chorizo pieces. The most important elements of this soup are that the vine tomatoes must be really ripe and the soup must be served thoroughly chilled. If your tomatoes aren't ripe don't make this soup it will be a waste! Also use a quality chorizo sausage and not a pre-chopped pack as this makes a huge difference too. The Illumina Food Processor makes light work of blitzing the tomatoes! Disclaimer: This is a sponsored post for which I received the Illumina range plus vouchers to cover my costs and time. Previous Post: « A few favourite recipes to celebrate my 2nd Anniversary! Looks idea for this hot weather. Could do with a batch of this for weather like this. Totally bookmarked this one for tomato season.